Vitamin D promotes intestinal calcium and phosphorous absorption and reduces urinary calcium loss, essential mechanisms for maintaining proper calcium levels in the body and for healthy bone composition. Vitamin D supports cardiovascular function in some individuals, which may be attributed to its effect on calcium metabolism or possibly by helping to maintain healthy plasma renin function. A role for vitamin D in supporting colon health by promoting healthy cellular function has also been suggested. Furthermore, vitamin D is believed to provide general cellular support, including for breast and prostate tissue, in part by helping to maintain healthy angiogenesis balance, supporting immune cell activity, and maintaining healthy cell metabolism. Vitamin D's role in immune health has long been established; vitamin D receptors are found on a number of immune cells, including lymphocytes and macrophages, supporting healthy immune cell activation. 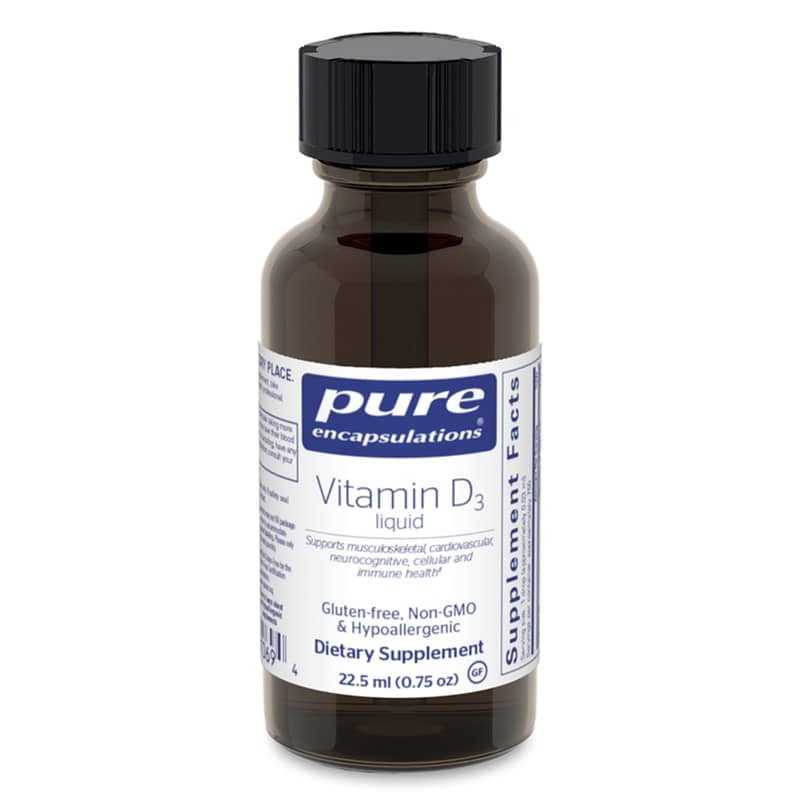 Pure Encapsulations Vitamin D3 liquid provides 25 Mcg (1,000 IU) per drop, an ideal daily amount. For individuals with greater short-term needs, this product allows for achieving 25,000-50,000 i.u. vitamin D3 per week without having to take multiple capsules. For the elderly, Vitamin D3 liquid is an easy to use form. Vitamin D3 liquid is offered in a base of medium chain triglycerides to support absorption. Vitamin D3 liquid is also free of preservatives, artificial colors, flavors and sugars. Other Ingredients: medium chain triglycerides. Contains NO: gluten, GMOs, hypoallergenic. Adults: As a dietary supplement, take 1 to 7 drops daily, or as directed by a health professional. It is recommended that individuals taking more than 50 mcg (2000 IU) vitamin D per day have their blood levels monitored. Accidental overdose of vitamin D can lead to serious adverse side effects in infants. This product is not intended for infants. The recommended daily dose of vitamin D for infants is 10 mcg (400 IU) per day. This product provides 25 mcg (1000 IU) per drop. If pregnant or lactating, have any health condition or taking any medication, consult your health professional before use. Keep out of the reach of children. The rubber top was squished when I received it and the drops come out too fast.